There's really nothing new that can be said about The Wild Bunch. Many consider it not only director Sam Peckinpah's seminal film, but one of the greatest westerns ever made. 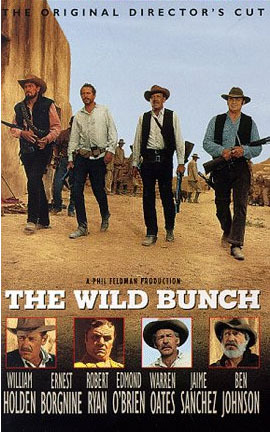 I think, more than any of the "Spaghetti Westerns", The Wild Bunch defines the post modern western, the "anti-western". Some folks think Eastwood's Unforgiven is the true anti-western, but I'd argue that anything Unforgiven did or tried to do, The Wild Bunch accomplished just as well, if not better. I don't say that as a snub to Eastwood and his work, but I think it takes a troubled spirit to bring to life such troubled spirits as Pike, Dutch, and the rest of the gang. At one point in the film, at Pike and Don Jose are talking, Don Jose points out that he can clearly tell that Pike and his gang are outlaws. Pike laughs, of course, and throws a kind of "takes one to know one" right back at the Don, who laughs and nods in turn. I think that understanding of the kindred spirit is what let Peckinpah create such a masterpiece. I have seen this film at least six times. I say "at least" because it is probably more, although some viewings were partial, just popping in a DVD and watching a few choice scenes. In film school I know I saw the movie twice for different classes, and I've seen it on the big screen twice, both times at the Coolidge Corner Theater, in my opinion Boston's best independent / art house theater. I watched the Director's Cut of the Wild Bunch last night at the Coolidge with my old film school comrade in arms, John Mayhem. John is something of a Peckinpah scholar (he wrote the essay on Peckinpah's Bring Me the Head of Alfredo Garcia for Hatchet Force Journal #1), and we both waxed nostalgic before, during, and after the film. it was great to sit and watch such a classic on the big screen, a cold beer in hand (yes, the Coolidge sells beer and wine to patrons, something I heartily approve of). As an aside, if you ever get a chance to see a great classic film on the big screen for the first time, don't pass it up. Even the best 60" flatscreens with home surround sound pale in comparison to seeing a classic like this in the venue for which it was created. If you haven't seen The Wild Bunch, do yourself a favor and indulge your inner outlaw for a couple of hours (even if it is on a "small" screen...). I dare say that it is a thinking man's western, a film that works on multiple levels. Not only are the heroes of the film firmly in their twilight years, but the film is set in 1913, as horses and sixguns are being replaced by automobiles and belt-fed machine guns. As this is a "post modern pulp" blog, I'll point out that I feel The Wild Bunch fits firmly in the post modern mindset. I think it is no coincidence that the movie was made at the height of the Vietnam War, when most people were beginning to realize that hey, we're probably not going to win this one. The world had become a much different place, and films like The Wild Bunch were as much an expression of that change as Don Pendleton's Mack Bolan novels. As the final line of the film states, uttered by the oldest of the 'bunch', "It ain't like it used to be, but it'll do." I remember watching this on TV as a kid ... "Relax. It's just some champagne we ordered" BLAM! The Wild Bunch really is, for me, the movie that started the 'anti-western' concept and blazed (in gunfire!) the path for movies of the 1970's to get grittier, nastier, more violent and further away from the white hat=good guy, black hat= bad guy standard. Certainly the questionable morality and ethics of protagonists had been around since the 1940's rise of film noir, but westerns were not nearly so shockingly violent or filled with such a stock of dubious characters on all sides of the law. Peckinpah had toyed with the idea since "Ride the High Country" in 1962 and his writing for television, but here he really brings to life a West so luridly full of reprobate bounty hunters, tobacco-stained codgers, venal industrialists, cynical and manipulative foreign emissaries, incompetent soldiers, brave but corrupt and hideously cruel tyrants and whoring, murderous, thieving, opportunistic and yet strangely charming outlaws. John Wayne didn't die until 1979 but his sort of movie was fading fast, shoved out of the way by Peckinpah's vision. Incidentally, I think Peckinpah's truest post-modern pulps are "Straw Dogs" and "Bring Me the Head of Alfredo Garcia", both extremely powerful movies (some may even say repulsive). Think of the gritty, dusty movies of the 1970's and 80's that bear the stamp of crazed grit, over the top violence and variety of dubious heroes. Thank you Sam Peckinpah. (As an aside, sever of my personal favorites of the pmp vein that I feel owe varying degrees of thanks to "The Wild Bunch" are Clint Eastwood's "The Gauntlet" (1977) and two of Walter Hill's macho thrillers "Southern Comfort" (1981) and "Extreme Prejudice" (1987) the latter was scripted by John Milus. 7It was certainly the movie that changed the face of westerns. I enjoyed it, and look at the quality of actors! Great actors. But I'm still of the old school, something between the B-western of the 1940s and Shane. Yeah, I liked John Wayne's later movies. My favorite western, after Shane, is Quigley Down Under.